This is a recipe that truly surprised me. After a whirlwind long weekend with family in town (my mom, my sister, and my two adorable—but energetic!—little nephews), I wanted to make something quick and easy for dinner last Monday night after our houseguests rolled out. Chili seemed like just the ticket. 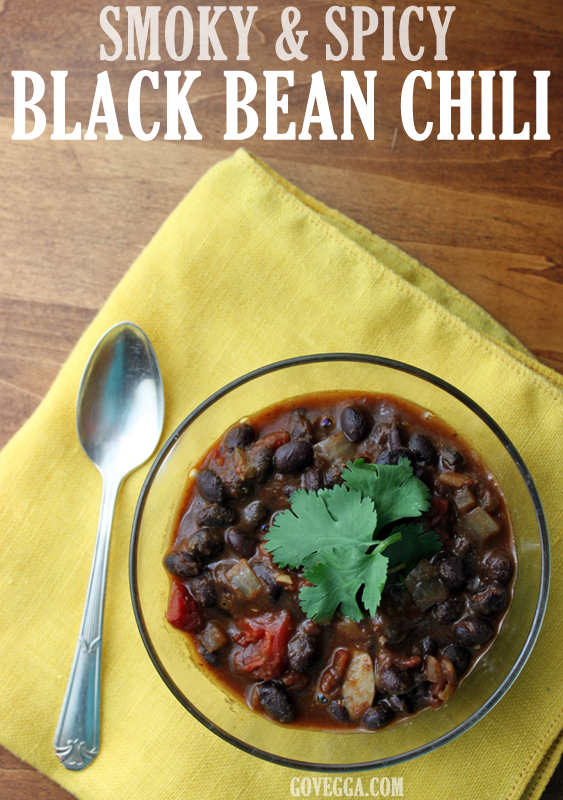 Without much fanfare and without trying to fancy it up, I quickly whipped up a batch of black bean chili. And it turned out to be one of the best chilis I’ve made in a while, despite having minimal ingredients. Smoky, hearty, richly flavored and beautifully textured, this chili is going to become a mainstay in my dinner repertoire. Use fewer spices, but more of them—lots of cumin and coriander provide rich flavor. Don’t rinse the beans! Instead, leave them in their aquafabulous coating. This makes for a gorgeously thick sauce that holds everything together and binds the flavor. My only regret? That I didn’t have enough ingredients on hand to make even more chili! This is a small batch, so feel free to double it. (I’d recommend not immediately doubling the serrano pepper and chili powder; instead, taste for spice and go from there.) 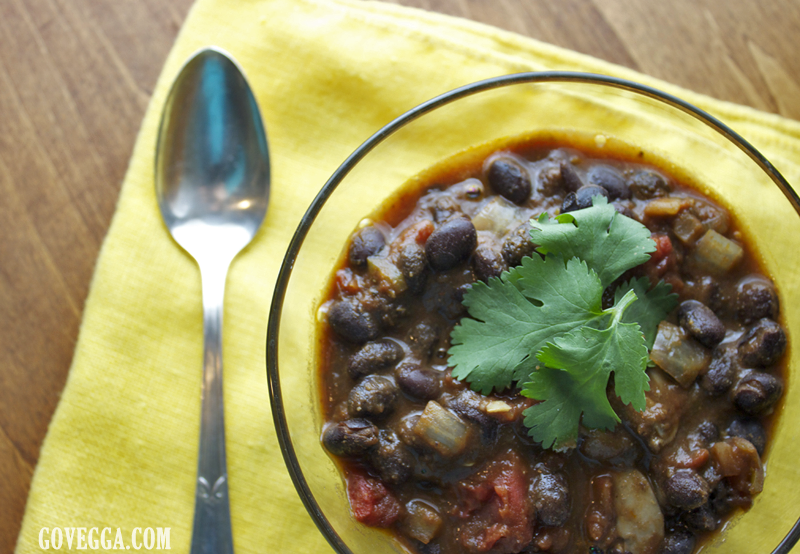 You could also omit the mushrooms if you’re not a fan, but I really enjoyed how their soft texture played against the beans in this smoky vegan chili. In a large stockpot, heat a tablespoon or so of olive oil over medium heat, then add the onion. Sauté for about 5 minutes or until the onion softens and becomes translucent. Add the mushrooms and let cook for another 3 minutes, then add the garlic and serrano chili. Sauté for another 3 minutes, then add the spices (cumin, coriander, oregano, chili powder, and smoked paprika, if using) and stir to coat. Cook for another 30 seconds, then add the tomato sauce, fire-roasted tomatoes, black beans, and corn. Bring to a gentle boil, then simmer for at least 20 minutes, stirring occasionally. Taste for spice and salt, then serve with your favorite chili toppings! I used piment d’espelette, a really lovely chili powder my brother and his girlfriend got me for Christmas from a Seattle spice shop they frequent. You can find piment d’espelette on Amazon or just use whatever chili powder you have on hand. I didn’t add extra salt because the tomato sauce and fire-roasted tomatoes I used contained salt. Your mileage may vary; check your brand of tomatoes and adjust salt accordingly. Oh I like your approach! Very clever tricks you have up your sleeve for this one… Clearly, I need to try it out for myself, ASAP.